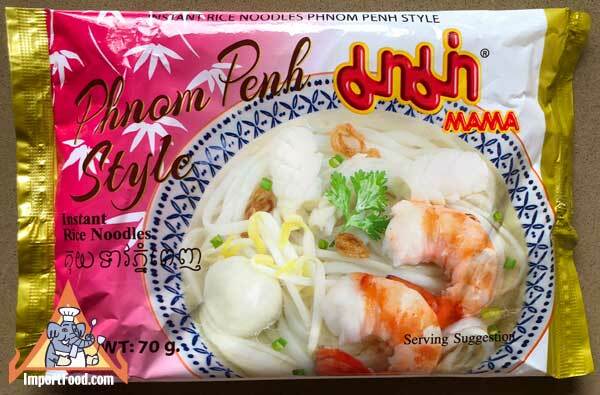 This is a brand new flavor from Mama, a gently spiced soup they call Phnom Pen style. We enjoyed making this with thinly sliced beef (see picture below), fresh cilantro and lime. Distinctive because it's made with nice white rice noodles not the yellow wheat-based noodles typically found in Mama (for example pork). Mama suggests adding shrimp, but you can simply add boiling water then let sit for 3 minutes and enjoy the noodles. Turn it into something extraordinary by adding fresh sliced chile peppers (jalapenos work best), bean sprouts, mint leaves, Thai basil, cilantro, or whatever you prefer. Ingredients: rice, tapioca starch, sugar, palm oil, salt, flavor enhancers E621 and E635, shallot, dried cabbage, shrimp powder (shrimp, salt), meat flavoring (tapioca and potato starch, salt, flavoring, coconut oil), dried spring onion, onion powder, chili powder, soy protein, shallot flavoring (palm oil, coconut oil, flavoring, wheat), soy sauce powder (soybeans, salt, wheat), chicken flavoring (sugar, salt, flavoring, soybeans, wheat), celery powder, curry powder (turmeric, cumin, coriander, fenugreek). Product of Thailand.